1.Take Maida, Baking Powder, Baking Soda together. Sieve it in a large bowl. 2.Take a deep bowl or container and pour melted butter in it. Add condensed milk to it and stir it nicely with a wooden spoon or a hand mixer. Then add milk and mix for another 2 minutes. 3.To this mix add the sieved dry contents. Add the Vanilla essence and give it a good stir for a minute so that everything is uniformly mixed. 4.Keep a cake baking pan greased with butter and dusted with flour ready before starting to make the cake batter. Pour the cake batter into it. Insert the cake pan into preheated oven. Bake the cake at 180 degree C for 20-25 min. 5.Switch off the microwave and allow the cake to cool down. To ensure that the cake is done, insert a tooth pick into it. The tooth pick has to come out nice and clean. Keep it in the refrigerator for around 20 min. 6.To make the icing, take a large bowl and place the whipping cream, vanilla extract, and sugar and mix well. Beat the mixture until stiff peaks form. 7.Refrigerate the icing for 30 min.Sprinkle the sugar syrup generously over the cake but do not over do it. Sugar syrup helps in keeping the cake moist. 8.Now spread the whipped cream over it into a smooth layer. Use a knife to spread it.. 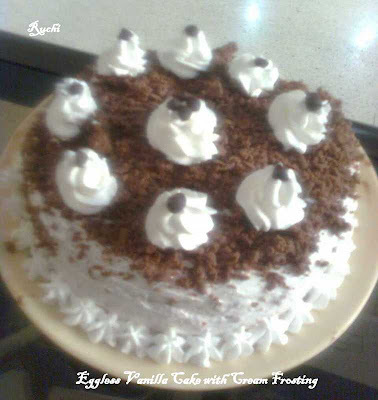 Spread the cream on the side of the cake and use a knife to smooth out any irregularities and give a fine finish. 9.Now, decorate the sides of the cake with the butterscotch over the cream layer.. Refrigerate the cake for half an hour. Cake looks extremely beautiful,well done akka..